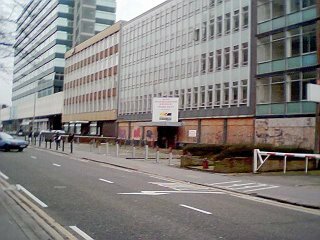 This charming picture below shows a pile of rubble; which mysteriously appeared outside a rather shabby office (situated on St James’s Road near Newgate Croydon), some time during 2003. Needless to say neither the owners of the building, nor Croydon Council, have done anything about it. As with all piles of debris, the ubiquitous abandoned shopping trolley has also appeared. Should you wish to view a slide show of pictures of this particular eyesore, please visit “A Pile of Rubble”.